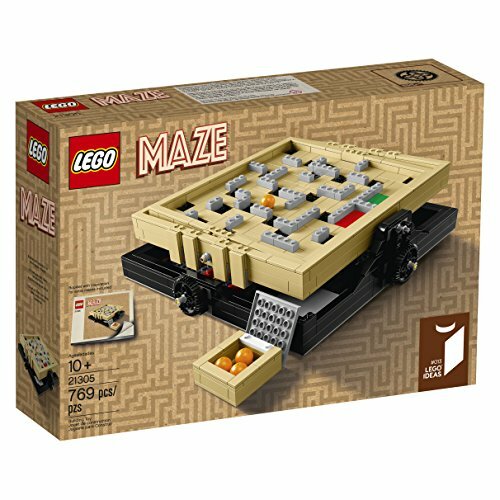 I can't say I was surprised when LEGO Ideas announced that the Maze was coming as a set. Builder Jason "JK Brickworks" Allamann is continually amazing us all with his clever mechanical builds. I used to play with one of these classic toys back when they were made of wood and used metal marbles. Now I get to play with one build from my favorite toys, LEGO bricks. This is the largest LEGO Ideas sets yet, in both part count and footprint. It's a pretty straightforward build, and when it's all done it's a functional, challenging toy. Though the lack of numbered bags combined with the part count means you better have a large place to build. The final design is pretty close to Jason's original submission to Ideas, and had some surprises in store for me, partly because I spent too much time playing the original wooden model, and partly because I didn't look very carefully. As Jason points out in a post on his website, the changes LEGO designer Steen Sig Andersen made to his original design were for the most part all positive and necessary. Little modifications like the reinforcement of the sides of the frames and in the mechanical linkages underneath. The maze surface was also reduced in thickness, resulting in more shallow recesses for the ball to get stuck in. This is one of the first minor disappointments for me, and more because of my failure to observe the obvious. The classic wooden toy had actual holes the ball dropped through, and a sloped interior that routed the ball to the bottom side where you would retrieve it. I don't know why I expected this in the LEGO version, I just assumed and never really looked close enough to realize that this just doesn't do that. The incorporation of the ball box into the travel stabilization is pretty ingenious, if a little clunky. I'd prefer to be able to unclick the box from the frame, rather than actually removing a part to slide it out. The integration of a simple bar and clip into the frame and box would have made this possible. Also a hinge on the box would have been more elegant in my opinion, rather than the limited studs removal (which tends to come apart, at least in my copy). The build was fun, and pretty typical for a set this size and complex. Once my maze was complete I started playing of course. This quickly revealed another shortcoming of the set, and once again I think all the time I spent with the original probably skewed my perceptions. The original had a laquered wood surface, and a polished chrome marble, both made for a very smooth action. The imperfections of the brick built surface, combined with the small but noticeable flat spot on either side of the balls made for more of a challenge than the actual maze itself. For instance this photo is not crooked, the maze is in full tilt, but you'll notice the ball is quite stationary, resting on one of the flat spots. But the biggest disappointment has to be the giant pile of leftover parts, at least that's what it looks like. These are the bricks to build the alternate castle inspired maze. One of the more clever aspects of Jason's design is the removable maze surface, which allows for infinite possibilities for customization. And TLG's inclusion of the parts to build one of these is quite appreciated, to a point. The problem is the lack of the surface itself. To build the alternate, you need to completely strip the original of it's surface and start over. Yes, this is more akin to a 3-in-1 type set, where you expect to disassemble to get the other models, but I was surprised and disappointed to discover this. The surface itself is just 18 parts, granted some of those are large plates, but still. I genuinely thought I'd have swappable surfaces, not a major overhaul between versions. Another minor gripe is the box, yes the box. I know it's just the box but all Ideas sets come with nice, hinged, reusable boxes, and most of them are great for storing the set when it's built. But the box for this set is the wrong shape to allow this, which could have easily been avoided by making the box square. Now I'm certain there are many factors I'm not aware of regarding box sizes and types, and I know this is petty, but once again I went to put it in it's box without questioning for a moment that it would fit, only to be surprised and disappointed again. It was sort of a recurring theme with this set. But overall I have to say despite my ranting I'm still impressed with the set. I realize I've griped a lot about it, but I'm trying to be objective and I understand that most of my disappointments are from misconceptions or preconceived notions, which is really my fault. There are few LEGO sets that actually become something functional, and when you're done with this it's an actual game of skill that you can display and play with. Combined with the infinite possibilities of customizing to your favorite themes (somebody already beat me to a Star Wars version, doh!) and I think this is a really special set. I give it 4 out of 5 Nerdlys.